Under the Act, One Person Company can also be incorporated for charitable for purposes. A firm can be a member of Charitable Objects. The Central Government at the time of revoking the license under this section may, if it is satisfied that it is essential in the public interest, order that the Company be wound up under this Act or amalgamated with another Company registered under this Section. In case of winding up or dissolution of an Association not for profit under this Section, there remain, after the satisfaction of its debts and liabilities, any assets, they may be transferred to another Company registered under this clause and having similar objects, subject to such conditions as the Tribunal may impose, or be sold and proceeds thereof credited to the Rehabilitation and Insolvency Found formed under section 244. A Company with the charitable objects can only amalgamate with the Company registered under same section and having similar objects. Where it has been proved that the affairs of a Company registered under this section were conducted fraudulently then every officer who are in employment in the company and who are in default shall be liable for action under section 447 and will be subject to stringent punishment. In the Act, activities like Sports, Education, Research, Protection of environment and Social welfare have been specifically added in the ambit of the objects, for which an Association not for profit can be formed. Now the Memorandum and Articles of such company can only be altered with the previous approval of central Government. Earlier prior central Government approval was required only for alteration of objects. The application for grant of license shall be made in Form No. INC 12 along with fees as prescribed in the companies. Under the Companies Act 1956, the said application was filed in Form 24 A. Director from advocate, charted accountant, company secretary or cost accountant in practice shall be submitted. Financial statement, board and auditors report for last 2 years shall be submitted along with application. There required a statement of estimated annual income and expenditure for next 3 years shall also be submitted. Publication of advertisement in at least one vernacular and English newspaper circulating in the director where registered office is situated. Special resolution is required to be passed. Detailed disclosures to be made in the explanatory statement. 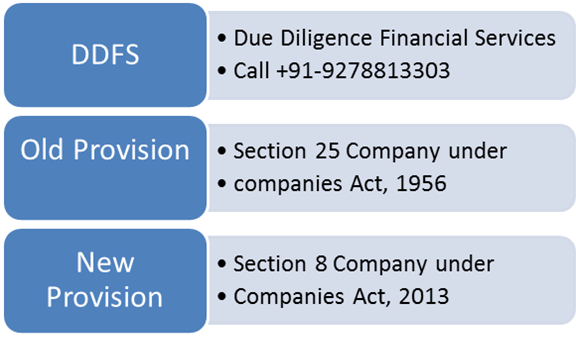 Due Diligence Financial Services is highly expert in the process of Section 25 or 8 Company Registration and provides services of Company registration Consultantin Delhi NCR including Gurgaon Noida whole of Uttar Pradesh Ghaziabad Patna Bihar Deoghar Jharkhand Ranchi etc. DDFinse. Simple theme. Powered by Blogger.